Each year I enjoy getting all the boxed of Christmas decorations down from the attic, setting up the trees, trimming the trees with our huge assortment of ornaments, and deciding where and how to display our eclectic assortment of Christmas decor. This year I decided to try something new and use all red and white decorations (along with our collection of Santas) in the front room. My favorite part of the red and white decor took me an entire afternoon to complete, but was worth it as it makes me smile every time I walk through the room. 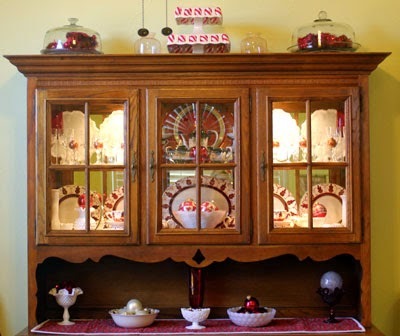 I removed everything from inside the china cabinet, cleaned it, and put together a display with an assortment of red and white items - milk glass, ruby red glassware, dark red & white china. (Based on the dinginess of the mirrors and the rather substantial protective coating of dust covering everything, it's been a while since I removed everything and cleaned the inside of the cabinet!) I then piled red and white Christmas balls in some of the dishes. Here's another angle, showing the red & white stuffed bears on the chairs beside the cabinet. 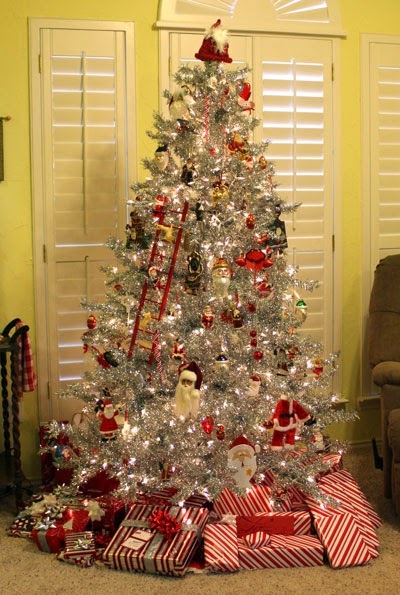 We used the silver Christmas tree in this room and decorated it with red and white and Santa ornaments. We spent this morning wrapping our gifts to each other in red, white and silver paper. 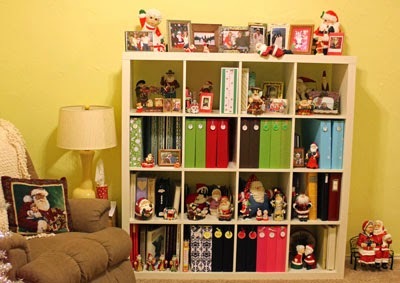 I arranged our Santa collection and photos with Santa on our memory shelf. 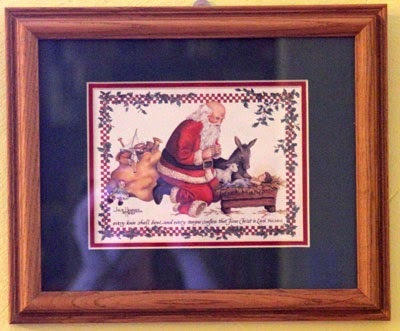 As a final touch, I replaced my God Is Love hook-a-rug with a framed Santa-kneeling-at-the-manger that a dear elderly friend gave me years ago. 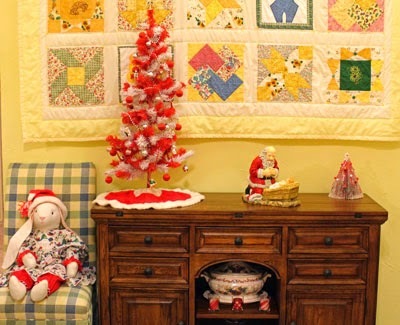 We had FUN using lots of red and white decorations in this room . . . and adding some "froufrou and whimsy" decorations throughout the rest of the house (which I'll share in an upcoming post). Do you have FUN decorating for Christmas? Do you use a color scheme in your decorations? beautiful Melissa, you did make me smile over the dust, I've just done the same with my cabinet. It looks wonderful....DD2 insists on a colour scheme for the tree....and nothing else is allowed out of the box. I always change my colour decorations around each year, and like you I move all things around in cabinets too. 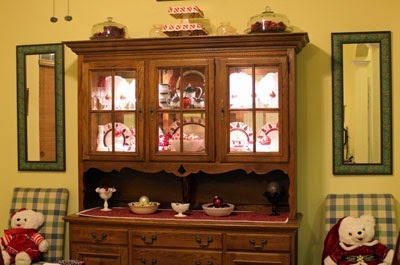 Oh what a lovely china cabinet and I like that you used the decorations in there too. Christmas all over the house! Looks fab - and very festive at your house.